Training and Racing With a Power Meter Journal: Tomas Gil wins Tour of Venezuela! Tomas Gil wins Tour of Venezuela! I just have to brag a bit on my athlete Tomas Gil. 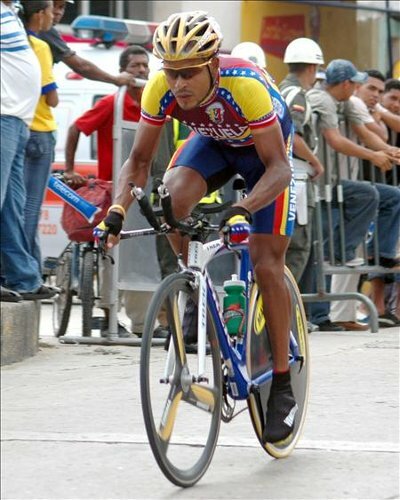 He has won the overall classification in the Tour of Venezuela. For those of you that do not know about this Tour, it is likely the hardest Tour in South America spanning 12 days and 13 stages. Plenty of high mountains in the Andes, time trial and hard road and circuits. I raced and completed it in 1995, nearly getting a stage win on multiple occasions. Easy is not this tour! It was Tomas' long time dream to win the overall and when he approached me back in the fall to begin coaching him, this was his main goal for the year. He bought a power meter and started training. Tomas is not a young guy anymore at age 32, but he is still open to learning after having been a pro now for almost 10 years. Changing his training and being open to new ideas and using his power meter has been a real revolution for him. 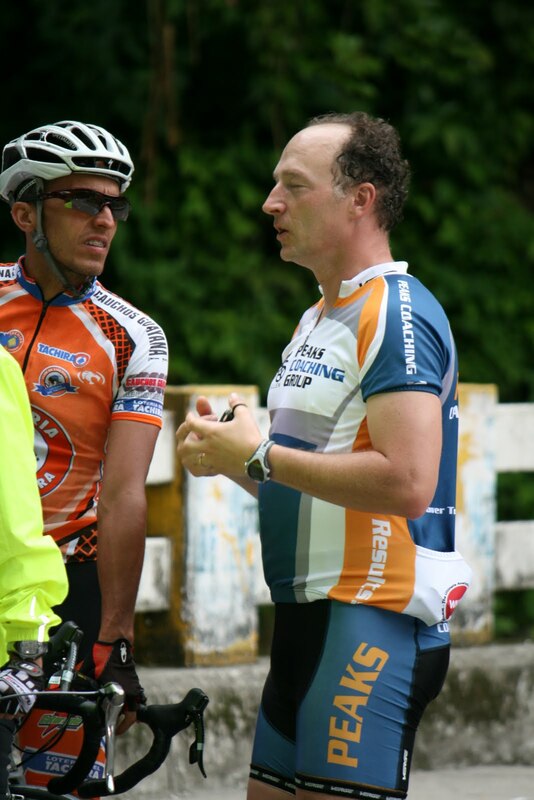 I went to Venezuela this past May for the first time since I was there in 1995 for a week long training camp in Merida, which is in the Andes. Tomas was able to attend and we got to spend some valuable coaching 'face' time together. I changed a little bit of the way that he was sitting on the bike, as he wasn't rolling his pelvis forward enough to access all of the gluteal muscles. Immediately, he had a 10-15 watt increase in power without any additional heart rate increase. It took about a month for him to completely adapt to this position, but I knew that it would help. So many riders sit on their bikes like they are sitting in an office chair and then round their backs, when really they need to roll those hips forward and then lengthen their spines. Everyday he rides with his power meter and looks at his TSS, his PMC and also strives to hit his wattage goals in each workout. We have been tweaking his PMC for a while now making sure that he came into the Tour of Venezuela with just the right CTL and also TSB. The weekend before the start of the Tour(the tour started on a wednesday), he raced in the Elite National Time Trial championships and he won by 5 seconds. This was his secondary goal for the year to be national time trial champion. We worked hard on making his position as aero as we could, he trained hard on his Trek time trial bike given to him by the BikePro bike shop in Caracas and he even bought a Quarq power meter for his TT bike, so he would be able to pace using wattage in this very complicated time trial. While the time trial win was very exciting, winning a 12 day stage race was even more. For those of you that have done even short stage races, you know how many things have to go 'right' in order for you to win. For a 12 day race, a lot of things have to go 'right'. Three of those things were that Tomas put 1:30 into his main competitor Jose Rujano (who placed 3rd OVERALL in the Giro D italia in 2008), as Rujano was the only one that could really outclimb Tomas. We knew that he had to win or be in top 3 in the TT stage and also put as much time into Rujano as possible so that he could afford to lose a little in the mountain top stage finishes. Download his TT file here! Then Tomas had to minimize any time loses to Rujano and stay with him as best as he could in all the mountains. With his FTP higher than ever entering into the Vuelta I knew that he would climb well. His FTP was about 355-365 coming into the Vuelta and he had lost two kilos before the race, so that should help. On the toughest Mt. stage, he lost only about 40 seconds to Rujano and he put time into his rivals and took over the Yellow Jersey. The following day was another tough Mt. Stage and just like in the Tour De France, wearing the Yellow Jersey gives you something 'extra' (maybe watts!?). He won the stage ahead of Rujano and put 15 more seconds into him and was now leading the Tour of Venezuela by 43 seconds. With the Mt. stages done, and a strong team, Tomas only needed to stay upright for the overall win. Defeated, Rujano dropped out of the race with two stages remaining and went home with his tail between his legs and now 2nd place as 1:50 behind Tomas with two relatively easy stages to finish. Tomas completed his dream yesterday in being crowned the Champion of the Vuelta a Venezuela. I am so happy for him and proud to have contributed to his wins. Of course, like I tell all the athletes that I coach, "I am just the Bus Driver"... you have to get on the bus and then do the hard work. Congratulations to Tomas Gil. He is a winner.